One of the first things you learn when playing sports is to KEEP YOUR EYE ON THE BALL. This also applies when watching sports, especially when you are in danger of getting hit by flying objects during the game. 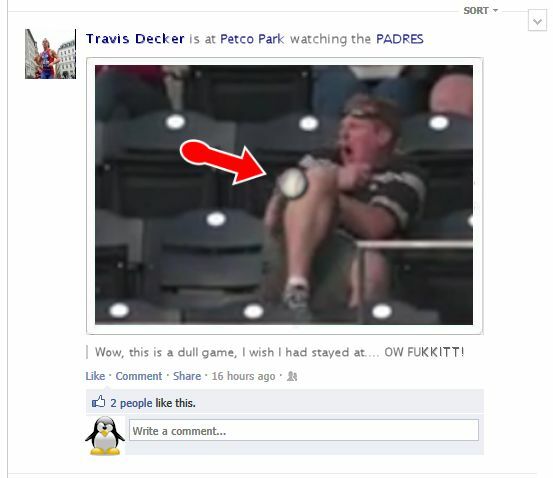 Travis Decker completely ignored this keen advice last Friday at the Reds vs. Padres game. Instead of watching an exciting game of baseball he was updating his facebook status, when out of the blue came a foul ball which gave him a little more than a 'Poke'. My first thought was, "I hope he wasn't supposed to be in work" followed by, "I bet that hurt" and then, "Where are the rest of the fans?" The latest status update on Travis is that there is no permanent damage and the swelling should be fully gone after the weekend, with the bruise disappearing after a week or so.